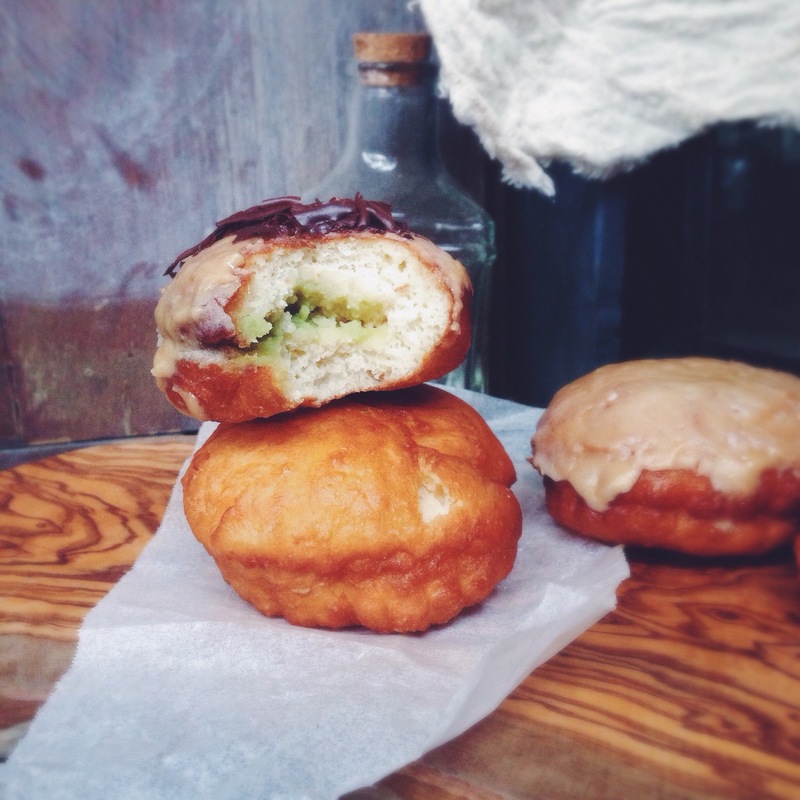 Yeasted doughnuts filled with kaya and drizzled with a strong coffee glaze. A tribute to one of my all-time favourite morning traditions. In other words– butter, kaya, bread and coffee. It doesn’t get any better, or simpler, than that. Sometimes it’s butter and honey, or butter and jam, but most of the time it’s butter and kaya. It’s really common here in Singapore, where you eat butter-kaya (a pandan-flavoured spread) toast from Yakun or some hawker stall with soft-boiled eggs, all downed with smooth, creamy kopi (local coffee made with condensed milk, AKA the best drink ever alongside teh halia… ok and maybe Coke). Yes, I’m talking processed white toast, pre-cut and plasticky; sometimes I get the fancy sort from the bakery if I feel like it, but usually it’s just that and not much more. The sort of bread you would squeeze and press with glee as a kid because the degree of artificiality pretty much makes it more playdoh than bread, and I know you know what I’m talking about. Let the Nespresso machine kick into gear. Slather two almost-burnt slices toast with salted butter, because I like my toast that way and because salty butter is a must in my morning regime. Anything else and I feel that I’m cheating myself of flavour. Salty and sweet forever, unless I’m baking, in which case I always stick with unsalted butter and add the salt myself. This recipe represents this magical, true-to-local-taste flavour combination. Doughnut form. 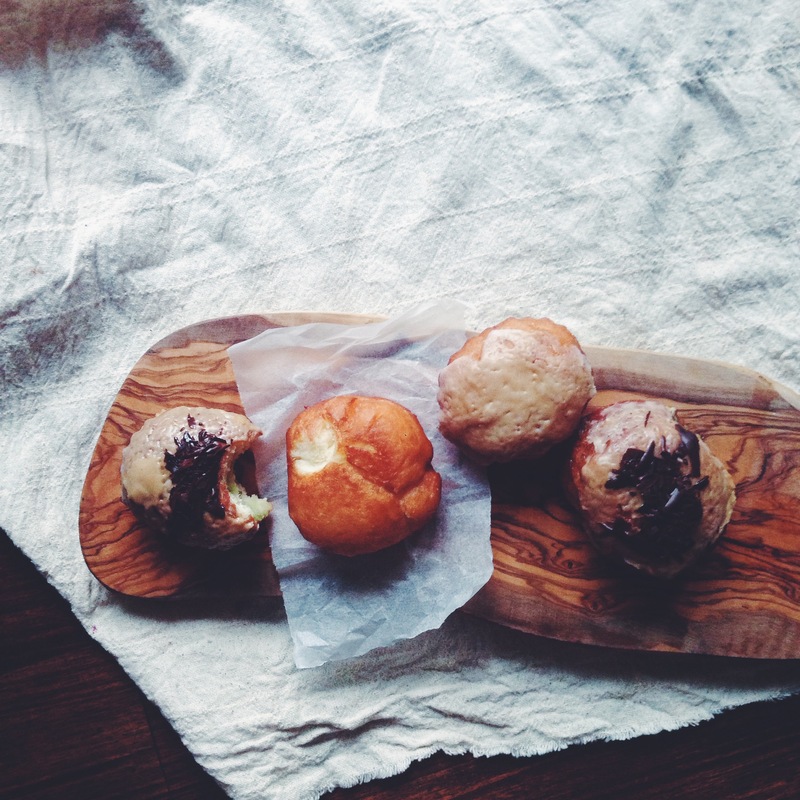 I’ve been itching to make yeasted, fried doughnuts for quite a while now, and when I got my hands on Baking Illustrated, with all the recipes tested and compiled by America’s Test Kitchen, I couldn’t wait to try their version of it. After 2 trials, a bit of tearful upsets and a lot of joyous finger-licking, I think I fell in love with the fluff and harmony of the final product. Their recipe advocates the use of vegeetable shortening instead of normal vegetable oil, and although they state that Crisco (veg shortening) yields the best result, I used canola oil in the second trial and couldn’t detect any distinct change in flavour or texture, so I doubt the change would produce a drastic difference if you used either. This was my first time making fried doughnuts, but definitely not my last. There’s a certain ecstasy involved in replicating something so ubiquitous, yet undeniably delicious. Perhaps I’ll test the recipe again with a different flavour combination, or just anything that involves a delirious sprinkling of icing sugar after everything is done and dusted. In a medium bowl, whisk together the flour, sugar, salt and instant yeast. Set aside for the time being. In your large mixing bowl fitted with a standard dough hook, mix together the eggs and milk. You could do this in another bowl if you don’t have a stand mixer such as a KitchenAid, just make sure the bowl is larger than the one in which you put the flour, and you will have to knead the dough for a little longer later in the process. After mixing the milk and eggs, add the flour. Mix on low speed with the dough hook until you see a ball of dough forming. At this point, take your butter and add it in 4-5 additions, mixing well into the dough between each addition. The butter should be soft, not cold and hard, to make the process easier and faster. After all the butter has been added, mix the dough for another 3 minutes. If you’re doing this by hand, knead the dough for around the same time or longer, until you get a soft, plump and pale ball of dough. Have extra flour on hand in case you need more; you should have a soft but firm ball. Not too sticky, but not too firm, either. Shape your ball (remove the slightly stickier bits from the dough hook first) into a ball if it’s not like that already, then place back in the bowl, cover with a towel and let rise until doubled, around 2 hours. It should be visibly voluminous when you come back to check on it later. After 2 hours, check on the dough– press lightly with a finger, it should feel tender but still quite firm. If not, leave for another 15 minutes. When ready, flour your work surface and tip your ball onto the counter. Take your rolling pin and flour that too, to prevent it sticking to the dough. Roll the dough out until it’s around 3/4 of an inch thick. Take a 3-inch wide circular cutter (or in my case, a scallop-edged one because I was feeling odd) and cut out circles of dough. Take the scraps left over and re-roll, then cut more circles. 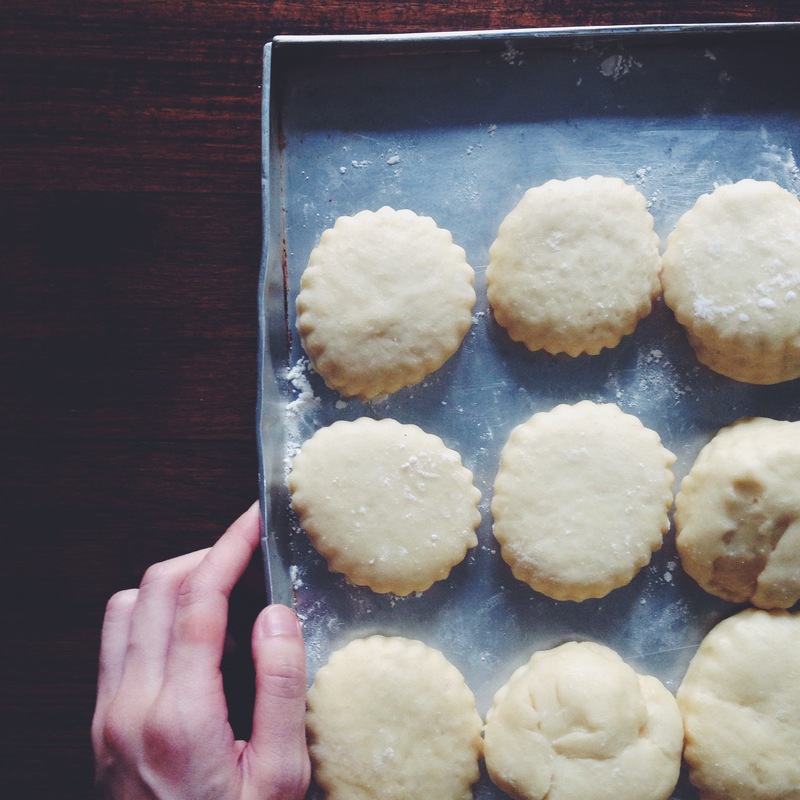 Place your doughnut circles onto a floured baking sheet and let rise for a half-hour more. In the meantime, heat up your oil in a deep and wide sauce pan, or large Dutch oven. Prepare another sheet that’s lined with paper towel, so you won’t get an oily counter afterwards. Stick a candy thermometer by the side of the pan and let it heat up until 375F, or 191C. Take your risen doughnut cut-outs and place gently using a spatula or large slotted spoon into the simmering oil, 4 or 5 at a time. Wait 20 seconds for the first side, then flip to fry the other side, which will take another 20 seconds. They will be golden-brown, puffy and all moreish-looking. Place the fried doughnuts onto the paper towel. Repeat until all doughnuts are fried. Let them cool on the paper towels for at least 15 minutes before filling. To fill, place the kaya in a piping bag, or into a large ziploc bag and cut off one corner just before filling. If using the piping bag, insert the nozzle into the side of a doughnut, and then pipe until full; the kaya will leak a little around the side if you pipe too much, too fast. If using the ziploc bag, use a knife to make a small incision at the side, before inserting the corner of the bag into the side and piping until full. To make the glaze, mix together the freshly brewed espresso and icing sugar. Dip the tops of the doughnuts into the glaze and let some drizzle down the sides. Sprinkle with chocolate curls before eating immediately, or at least on the same day. 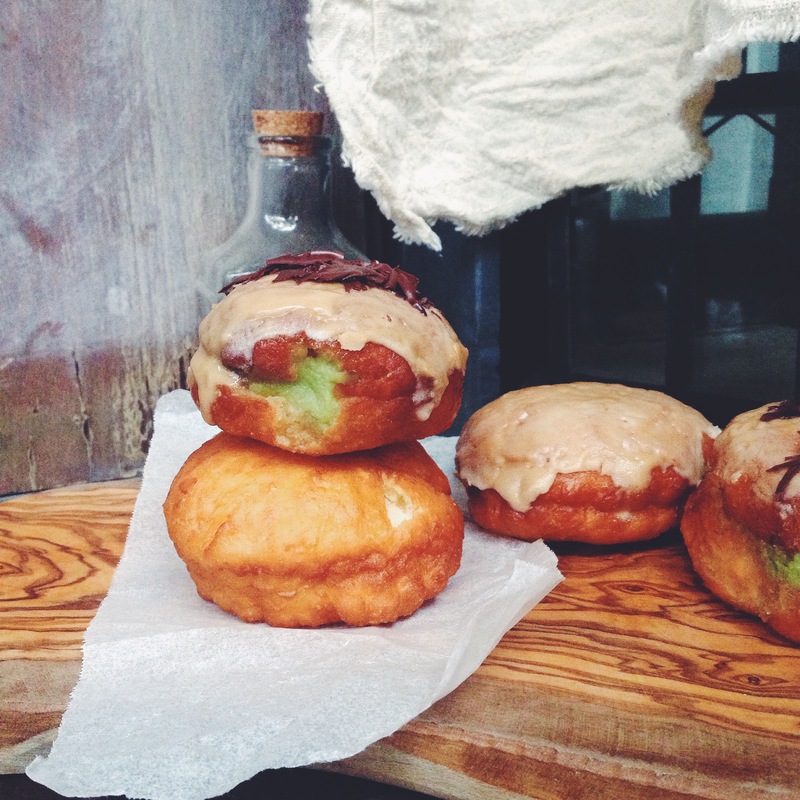 Keep these doughnuts at room temperature for up to 2 days, else they just won’t taste fresh!